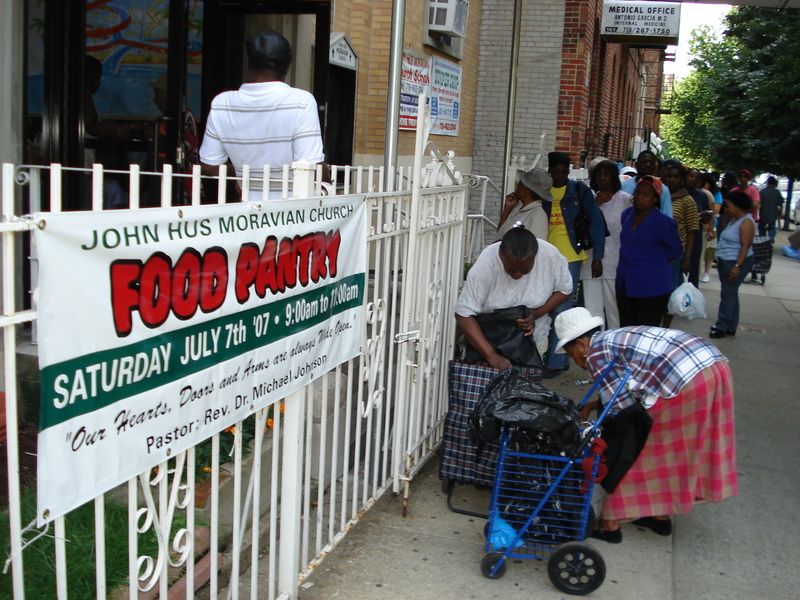 Food Pantry Our Food Pantry is run by the Outreach Committee under the guidance of Garilyn 'Martha' Martin and is open to the public on the First Saturday of each month unless otherwise advertised. The program is totally underwritten by the church and provides culturally appropriate and appealing food items to the participants. The only criteria for participation is that names and addresses be provided. Distribution usually starts at 9:00am, although persons are usually in line before 7:00am. This is one area in which we do ask for your financial contribution to ensure that this ministry continues. Sister Garilyn Martin is the Coordinator of the Outreach Ministry. Youth Fellowship Held on Fridays at 6:30, is open to persons twelve and older. Through this ministry our young people have an opportunity to understand how God's word impacts on their lives and what is required of those who are Christians. Every effort is made to have the meetings and activities be a time of fun, fellowship and learning. Kyonne Rowe is currently the president. Sunday School provides the early opportunity for awareness and training of our young people in our Christian faith as well as in what is Moravianism and how that should be expressed in their daily lives. Through a dedicated team of teachers including Pat Campbell, Ruth Ricketts, Vernalyn Rowe, Ingrid London, Ivalyn Jarvis, Chloris Hicks, Jean Straker-Tannis, Edith Valentine, Karlene Woodbine and Grace Peters, this important ministry is kept vibrant and relevant. Sunday School is held on Sundays at 10:15 am and there is always a snack available afterwards. We will arrange to pick up your child if you contact our office with this request. Praise Dancers - One of the most recent additions to our worship experience is this very dynamic group that is open to young ladies of all ages. As they practice on Saturday mornings at 10:00am, they learn that the dance ministry is not simply about displaying their ability to move artistically but that it is also using this medium to shed light on the gospel. They bring high quality performances to worship and special events and are always open to persons who share this interest. Choreographer and Artistic Director is Arlene Rickettts. Soul Survivors The intermediate choir of our congregation that is open to persons twelve to about thirty age group. The focus is on using contemporary Gospel Music to bring the gospel alive and make an impact, not only on our worship, but also on the lives of the choir members. We are especially inviting the young people in our community to be part of this very important ministry. Practice is held at 8;00 pm on Fridays. Christian Nathaniel is the director. Fitness Program and Health Ministry: Open to the community - Saturday morning at 8:00 am. The classes are coordinated by the Health Fellowship Ministry, guided by Sister Jean Straker-Tannis and benefits from a certified Fitness Instructor. You just need to turn up; we will take it from there. Praise Team This ministry combines contemporary and traditional praise songs to invoke a higher level of energy in our worship experience. The team invites persons who love God and singing to be part of their ministry which currently includes: Garilyn Martin, Margaret Williamson, Vickie Ellis, Sonia Brown and Veneka Harris. Mr. Odinger Greene is the Musical Director. The Chancel Choir This choir has the major responsibility for leading the singing in our worship services. The choir meets on Wednesdays at 7:30 pm for practice and we do invite you to come in and be part of this ministry if you feel a sense of call in this regard. The Multimedia Ministry Spearheaded by Sister Carole Johnson, this team ensures that the technological aspects of our ministry stay operational and up to date...from our worship slides and projections to live video streaming and recording, to the public address system. The Junior Choir This is where the love of music and singing is nurtured. We take children from three to 12 years of age and help them to develop their love for Jesus and their talent of singing. This choir meets on Fridays at 6:00 pm and is directed by Christian Nathaniel. Mission Team This team focuses on being the face of Jesus through the hands of our members. Our main focus has been in Mississippi working with Habitat for Humanity, but we have been to Sturgeon Bay, WI, other areas in Brooklyn and Staten Island, and plan to extend our operations. Hyacinth Grant is the Team Leader.